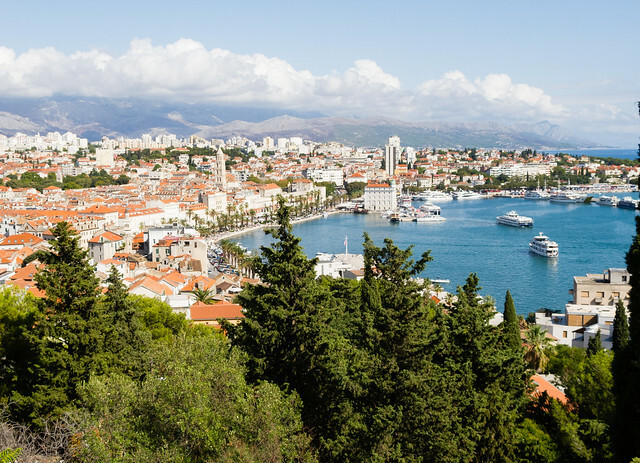 Split is a major port city, with 25 berths for ferries and cruise ships, and today I’ll take one of the ferries out to the islands. 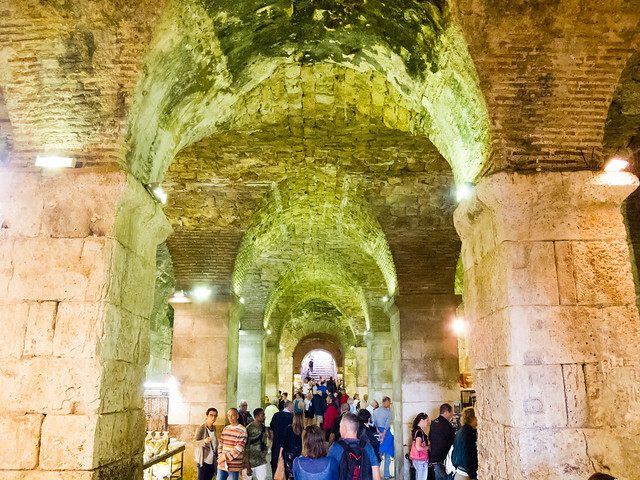 My plan was to mostly chill out, check out Diocletian’s palace, and head to Hvar Island on the catamaran Vida, which I’d read online would take bikes. The weather was supposed to be better, so I planned to hang my laundry in the yard to get a chance to actually dry it for the first time in days. I walked outside with my clothesline and it immediately started to rain. I howled in despair. And then, it turned out that the Internet was wrong about the Vida (shocking, I know). 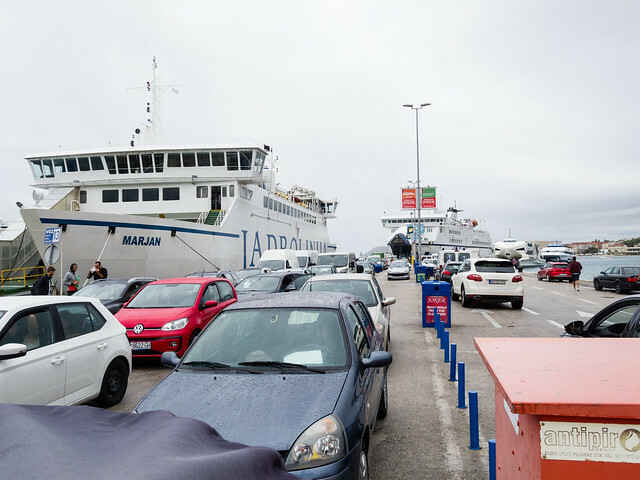 No bikes allowed on any of the catamarans, only on the auto ferries. So I booked the 17:00 auto ferry, but I didn’t realize until later that the car ferry to Hvar Island stops at Stari Grad, not at Hvar town where my hostel was. 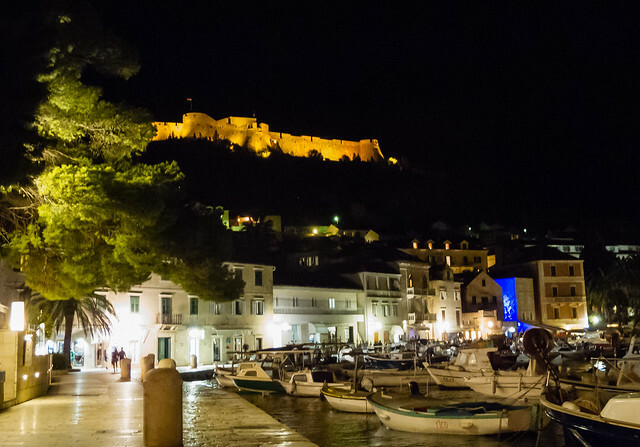 (The catamaran stops at Hvar town). So to get where I needed to go, I would have 20km of riding, beginning near dusk, arriving in the dark again. 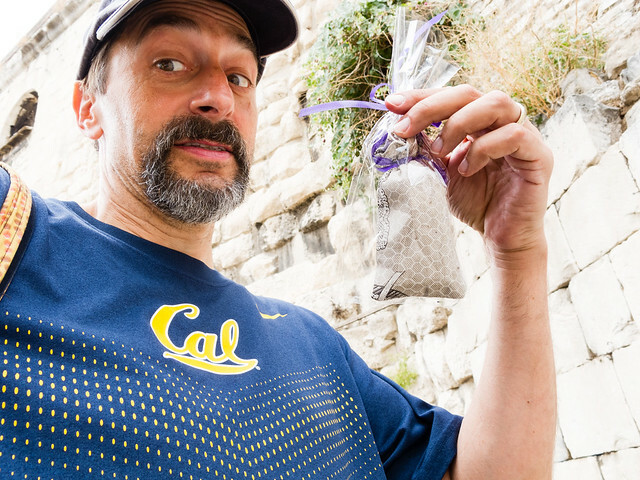 The weather, at least, did clear up around noon, and I went up the bell tower for the view, and checked out the street market, where I bought a lavender sachet to address the funky pannier problem of bikepacking Day 6. 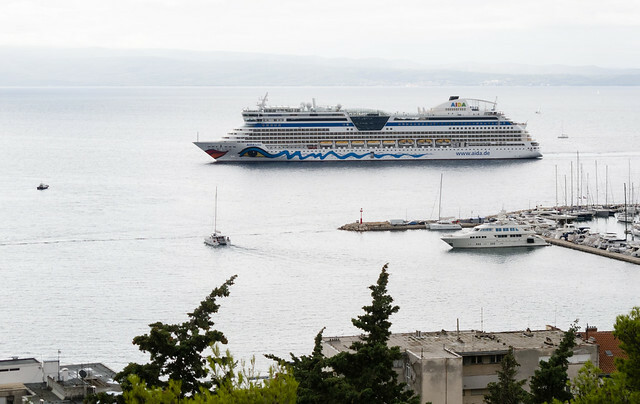 As a major cruise ship destination, Split is overrun with people, especially compared to the places I’d been so far. There are bits of it that are beautiful, but the crowds and the restaurants on the waterfront are pretty oppressive. (We later termed it the Splitshow). 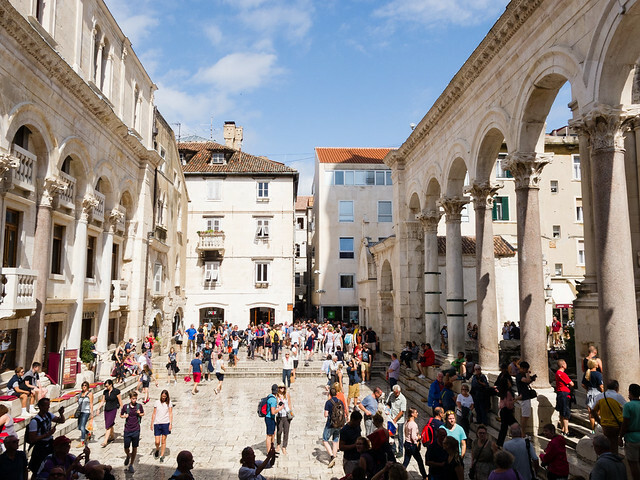 Part of the Splitshow surrounds Diocletian’s palace, where a few scenes from Game of Thrones were shot, spurring large amounts of selfie-stick activity. Walking up to the overlook over the harbor, you can see why the tourists come here; it’s really a beautiful bay. Just less so because of all the tourists. After a relaxing day, I almost managed to miss my ferry, because two different ferries leave for Hvar at 5:00, and I went to the berth for the wrong one. But I made it, and sat there stewing about the situation for the two hours of the ferry ride as the sun went down. As we hit land, I got into the line of cars rolling off the ferry and put the hammer down, making good time out of town and towards the ridge. 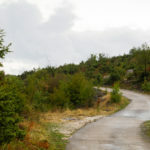 There are two ways to Hvar town from Stari Grad: the bike route over the mountain, or the car route through the tunnel (no bikes allowed). I hammered through the tunnel which saved me 30 minutes or more. It was kind of fun and I didn’t have any traffic in my direction. After the tunnel, the road had great views over the Adriatic as the highway rolled along the cliffs. There was very little traffic, so even though the light was failing the road didn’t feel risky. 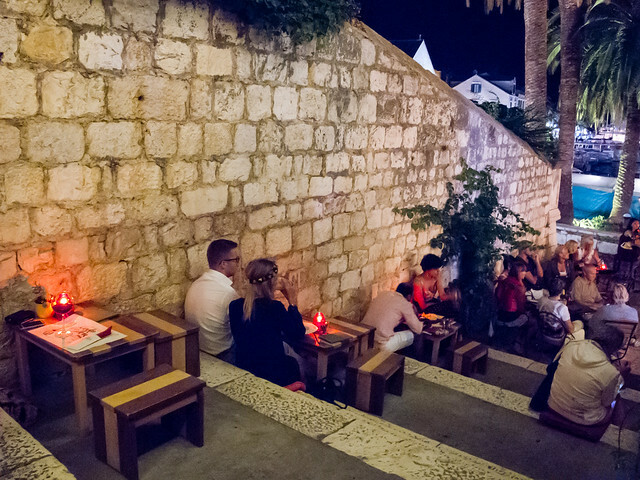 Hvar turns out to be a Miami Beach-style party town; lots of big party boats and fancy hotels. It was hard to find the hostel, which was down an alleyway past two music clubs, and had no sign. Once I found it, I had a nice dinner on the stairs listening to a jazz singer, and finally caught up with my friends Dave and April for a drink after our respective meals. Biking is really transformative. I was in a foul mood the whole way on the ferry, feeling cheated out of my easy day by poor info online and my own incompetence at reading schedules. But as soon as I got on the bike and made some progress, I was fine. It was less than an hour to Hvar town but my mood had totally changed when I got there. That’s a lot of why I ride.